My mom is up for anything. I should have known this growing up. There were periods of time where she was determined to learn to sew and created matching outfits for the whole family. She went on to try golf, and bowling, and rollerskating. Really, I think of my mom and I can picture her in so many different capacities (except the kitchen). I think, though, that since moving to Wyoming to be with me and her grandgirls; she has taken it to a whole new level. If I tell her I am learning to fish. She wants to learn to fish. We buy our poles and our tackle and we hit the waters here in Jackson Hole. She got so excited that she even tried fishing by herself but ended up lost in the side channels of the Snake River among the smell of Moose urine and decaying things. The next time we went out, just the two of us, and we chase these same two grouse around the woods for about two hours. I learned and she learned very quickly that when I get my nose on the scent I forget about everything else around me; especially her different capacity for hiking than myself. I get a shot at one grouse and miss it twice (a shot to the head with a .22 handgun proved challenging). No grouse, but it was a success. I took my mom on a multi-hour hike in rough terrain and she only wanted more! My mom swears she would have hit that grouse as we debriefed over a beer at the bar afterwards. We hunted through the last half of October and all of November. In all, I took 11 grouse. My mom did not shoot any but she cleaned about half. She followed me wherever I went, even when the snow fell and we had to borrow snowshoes. She’s a champ and she is a champion of me! I never realized until a few years ago how much of an influence her quest for adventure and new experiences had an effect on me until now. Grouse season closed and I am on to snowshoe hares and guess what my mom is shopping for? You got it, snowshoes! 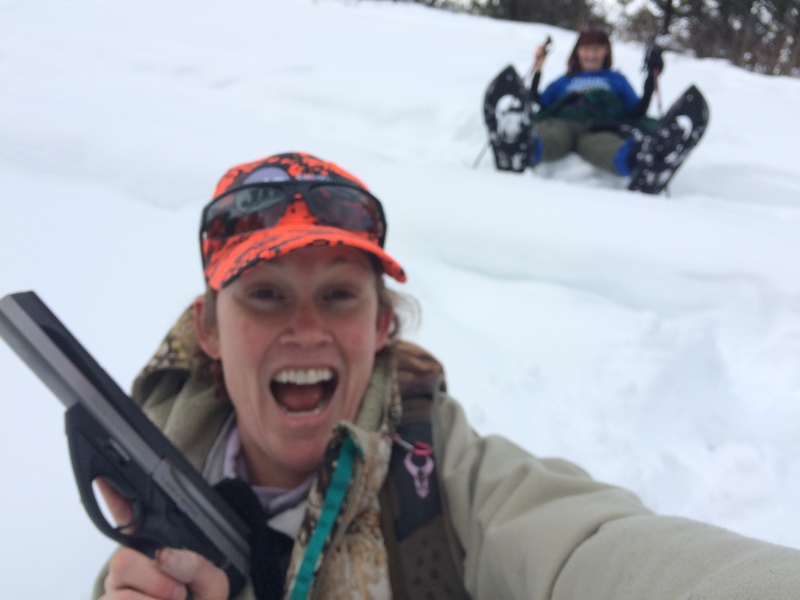 Great blog posting, hope you shoot the hares and not the snowshoes.